Enjoy a game of football at Domaine de la Noguiere Campsite. Want to explore? Domaine de la Noguiere Campsite could well be for you. Want to have a closer look at Domaine de la Noguiere Campsite? If you think Domaine de la Noguiere Campsite in Le Muy, Riviera & Provence is the holiday park you, why not have a closer look, and check out prices and availability. Domaine de la Noguiere Campsite family holiday park has 350 pitches. Eurocamp have family holidays parks all around Europe. Domaine de la Noguiere Campsite (RV024) is just one of the family holiday parks in Le Muy, Riviera & Provence, France. Have a look for other holiday parks in France. You can also see what other people though with the reviews of Domaine de la Noguiere Campsite. These are the reviews for Domaine de la Noguiere Campsite. There are 42 reviews. Had a fabulous holiday and can't wait to return next year. Generally overall the holiday was good. had a slightly end of season feel. the restaurant offer was pretty weak and as the parc was owned by a dutch family lacked a french experience. I would have expected a lot more facilities and better kids clubs than we had. most of it was in dutch and there were very few things that interested the children. Great holiday and accomodation. Much enjoyed. Good site in a good position. Overall everything was very good perfect. A lovely park with good facilities. it's close to lots of great places to visit so makes an ideal location for a holiday if you want something within driving distance of all the seaside resorts but a little quieter. We stayed at 3 different sites during our holiday; this site was the main one. It was very hot, although we had 2 thunderstorms, one of which resulted in the tent being flooded. The site is dutch owned, which we did not realise when we booked, and lots of the activities and notices are in dutch. It would have been good to have known this before we went. However, all the campsite staff had good english and it did not really detract from our holiday. The park is lovely and very well set up. It was perfect for young children (ages 7 & 9). the pool is great and the park is not too big so the children could safely wander around on their own. There is a little road noise at night but we didn't notice it after a while. The park is very dutch orientated which is fine although as brits we felt slightly as outsiders. Having said that, the couriers do try to make entertainment accessible to french and english too. My only suggestion would be to have more traditional french dishes in the restaurant. It was nice food though and great that kids' meals are free if you order adult meals. My recommendation is to buy food from the local casino and book a couple of dinners in the restaurant. My fifteen year old daughter and I had a wonderful stay. Everyone on the campsite was friendly and the atmosphere was relaxing. The mixed gender toilets and showers were a surprise at first hence the nine rating for the camp. We soon got used to it though! would definitely return! Generally a good park a lot more busy than we were used to. The courier was very poor especially when compared with other eurocamp couriers. He was not interested in the welfare of campers at all and made no effort to see if we were happy during our stay. Tents could be cleaner too. We have been to this site before as it is overall an excellent place to have your base for exploring provence. The site is quiet with stunning views and a short trip to le muy for provisions. The courier thomas was outstanding and bent over backwards to ensure we had everythnig we needed - he even bought my son an ice cream when he fell off his bike. The best eurocamp courier ever!. . we would highly recommend this site. .
We had an absolutely fantastic time on holiday and were very disappointed when we had to come home. The parc and facilities were excellent and I am really looking forward to booking next year. Not much in shop bread prices double to shop 2 mins down road n=and lots of road noise at night. Great family holiday under canvas! We spent an enjoyable week in le muy. 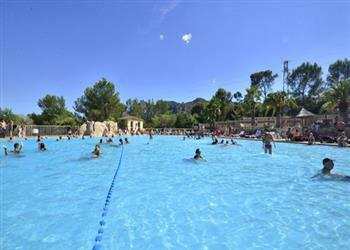 the campsite is set in an attractive setting in a very pleasant region of provence. The weather was great and we spent most of our time at the campsite with a few day trips. Small parc in a hot region. Great entertainment for children. Showers not always very powerful or hot though, small pitches compared to other sites visited with eurocamp and restaurant could be more casual with a cheaper and plainer menu. We had a nice holiday but would definitely not return to this park. We weren't aware that it was run as a franchise of rcn which is a dutch company. All the staff are dutch, almost all of the campers were dutch and all of the entertainment is in dutch. There is no reference to the fact that you are actually in france other than the french tourist information leaflets. None of the staff converse in french so if you are after an authentic french experience with the opportunity to practice your french language skills as we were then this is not the place to go. Although the eurocamp couriers were pleasant enough we felt very much as outsiders as one of the very few english families on site. We also found that our fellow campers seemed to make very little effort to be friendly so our children were not only excluded from the entertainment programme, they didn't get the opportunity to make new friends to play with. Beautiful setting, great weather, comfortable and clean camping. We enjoyed our holiday but..... the camp was 90% dutch holiday makers and run by a dutch couple so everything was aimed at the dutch. The events organised by the camp were only described in dutch. The pool was clean though at times very crowded. The campsite was full of mosquitos and ants- perhaps you could suggest they use some insecticides. We definitely saw a rat one evening at the back of the tents. The tennis court had definitely seen better days , and having to spend 5 euros renting a court that was more pot holed than most english roads seemed a bit much. Not enough to do for teenagers, not enough areas to sun bath so this made you leave the site to head for the beach. Staff and eurocamp reps were excellent and very friendly and knowledgeable. Enjoyed the holiday been to the region the previous year so knew what to expect. The best holiday we had for 8 years as the smith family, made extra special by bill and judy, they were awsome! ! Disappointing site, many areas for improvement. We will not be returning here. Great parc and really nice service. We had an absolutly great time! very realxing and was nice to spend time with the family without all of te pressures of home. Hi we had a great holiday here, but the noise from the busy road close by was very off putting being in a small rural park we would have proffered peace and quiet. . the park itself is pretty and the pool area great for the kids but there was no information in english only in dutch! . . our son fell on the slippy wet bath room floor badly injuring his chin and requiring medical treatment and there were no instruction's on how to get to the hospital apart from the dutch version, luckily we could decipher through out sat nav. . we did enjoy the area and our time there but in comparison with the other two camps we stayed this year we think this one comes 3rd and and a poor 5th out of all our eurocamp campsites to date. Again another excellent holiday in france with eurocamp. A perfect holiday, thank you! Had a reallly relaxed time pool was fab although a few to many rules they were not enforced at this time of year so fairly relaxed. . the curriers were very helpful. The lake(pond) was also a delight catching 12 pound mirror carp and cat fish. The park was lovely, the accommodation was very good, ie comfortable, clean, ect.. I think the park needs some sort of entertainment programme as if you want to stay on site there is nothing to do apart from the pool or fishing. A lovely calm parc, within easy reach of the coast. Plenty to do in the area - markets, canoeing, walking and sightseeing. We cannot speak highly enough of the couriers, bill and judy. They had loads of info in the reception and a library of books and games, and were very friendly and approachable. Plenty of showers and hot water, kept in an excellent condition.